"Wind of Change" is a power ballad by the German rock band Scorpions, recorded for their eleventh studio album, Crazy World (1990). The song was composed and written by the band's lead singer Klaus Meine and produced by Keith Olsen and the band. It was released as the album's third single in January 1991 and became a worldwide hit, just after the failed coup that would eventually lead to the collapse of the Soviet Union. The song topped the charts in Germany and across Europe and peaked at number four in the United States on August 31, 1991 and number two in the United Kingdom. It later appeared on the band's 1995 live album Live Bites, their 2000 album with the Berlin Philharmonic Orchestra, Moment of Glory, and on their 2001 unplugged album Acoustica. 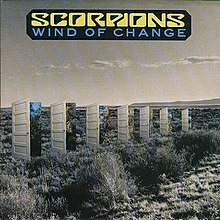 With estimated sales of 14 million copies sold worldwide, "Wind of Change" is one of the best-selling singles of all time. It holds the record for the best-selling single by a German artist. The band presented a gold record and $70,000 of royalties from the single to Mikhail Gorbachev in 1991. As of April 2019[update], the video for "Wind of Change" has been viewed more than 680 million times on YouTube. The lyrics celebrate glasnost in the Soviet Union, the end of the Cold War, and speaks of hope at a time when tense conditions had arisen due to the fall of Communist-run governments among Eastern Bloc nations beginning in 1989. The Moskva is the name of the river that runs through Moscow (both the city and the river are named identically in Russian), and Gorky Park is an urban park in Moscow named after the writer Maxim Gorky. "Wind of Change" opens with a clean guitar intro played by Matthias Jabs, which is played alongside Klaus Meine's flat whistle. The song's guitar solo is played by Rudolf Schenker. The band also recorded a Russian-language version of the song, under the title "Ветер перемен" ("Veter Peremen")   and a Spanish version called "Vientos de Cambio". In 2005, viewers of the German television network ZDF chose this song as the song of the century. ^ Bregestovski, Anton (December 15, 1991). "Rock group meet Gorbachev". upi.com. UPI. Retrieved February 3, 2019. ^ "Top 10 Denmark" (PDF). Music & Media. Retrieved March 21, 2018. ^ "Charts.nz – Scorpions – Wind of Change". Top 40 Singles. ^ "Scorpions: Artist Chart History". Official Charts Company. Retrieved November 16, 2018. ^ "Scorpions Chart History (Hot 100)". Billboard. Retrieved November 16, 2018. ^ "Scorpions Chart History (Adult Contemporary)". Billboard. Retrieved November 16, 2018. ^ "Scorpions Chart History (Mainstream Rock)". Billboard. Retrieved November 16, 2018. ^ "Single top 100 over 1991" (pdf) (in Dutch). Top40. Retrieved April 13, 2010. This page was last edited on 22 April 2019, at 07:40 (UTC).